The world of art over the course of the last century or so is often told in the impressive sums of money that various pieces achieve at auction. Whether tens of thousands or hundreds of millions, the intrinsic value of the work itself rarely rates so high, but the perceived value can put sale prices into the stratosphere and beyond. As talk goes on about the potential of a bubble in the current art market, and many shakeups happen in the traditional buying patterns as the newly wealthy of developing nations enter the marketplace, this frenzy of high-ticket auction sales has touched almost every area of the art world, with one notable exception: photography. At least, until recently. Typically, the biggest sale prices are awarded to the paintings of European old masters, but they rarely change hands nowadays. Sculptures also often command high prices, but photography has been left largely out of the big leagues when it comes to pricing. Perhaps this is due to the ease of reproduction - it's hard to be entirely sure that you're buying a singular, unique object, after all, and digital photography has made this even more true that it ever has been before. 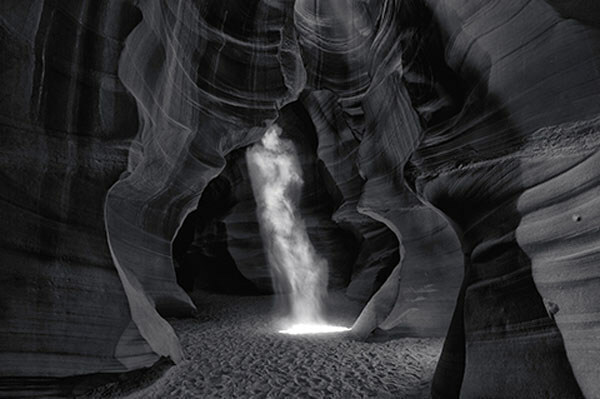 It's remarkable, therefore, to see the truly eye-popping figure of $6.5 million USD attached to a photo, as in the case of 'Phantom', by Peter Lik, (shown above, all credit to Lik, of course), which was sold in early December. The piece is ethereal and atmospheric, shot in what looks like a sandstone cave. Lik is naturally a bit coy about where exactly it was taken, as numerous other photographers have attempted to recreate the image. The most he'll say about it is that it was shot in the Southwestern United States, which appears consistent with the type of rock formation shown. From a technical standpoint, the image is quite remarkable, as it features a very high dynamic range in black and white, but the actual aesthetic quality of the piece is also quite moving.